Celebrate the bride to be with the sophisticated beauty of Creative Converting's Two Love Birds Collection. Black flowering branches and white birds pop on a background of soft stripes. Coordinates beautifully with Black Velvet and White tableware. Whether you're planning an intimate dinner, a family gathering, or a huge party, you can Trust Creative Converting for high quality, consistent color matching, and attention to detail. 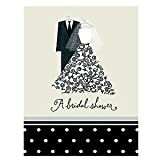 I Do Bridal Shower Invitations (8 count) have a beige background with a bridal dress and groom suit and a border of black with white polka dots. Inside message reads: For, Date, Time, Place, Given By and RSVP. Package includes 8 white envelopes. Cards measure approximately 4" wide x 5" high.